I hope you’re well and that you don’t mind me getting in touch with you! ​My name’s Jess and I’m a Casting Assistant Producer at Studio Lambert. I’m currently working on a show at E4 called Body Fixers – a makeover/under show which aims to help people to look and feel their very best. We’re especially interested in reaching out to members of the trans community who may be interested in applying for a makeover/makeunder on the show. Our expert team can help with non-surgical cosmetic procedures, for instance jawline reshaping. We can currently accept applications from 18+. I wondered whether you would kindly spread the word via any internal mailing system/social media pages you may have? I have attached our flyer so if you’re able to share this that would be really helpful. We’re looking for clients to visit our pop up salon and be given a dramatic transformation by our super talented beauty professionals with beauty treatments, hair redesigns, non-surgical cosmetic treatments and complete top to toe make-overs/unders. We work with an expert team of fixers - all hair and beauty professionals from around the country – will ensure that everyone who enters the Body Fixers salon leaves looking and feeling amazing. 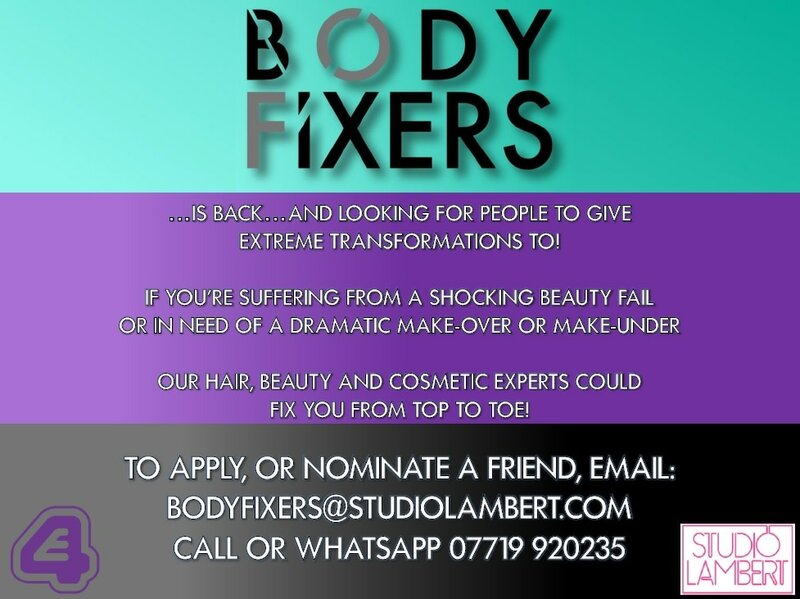 Anyone interested in finding out more about how they can be transformed by our team can get in touch with the casting team by emailing me direct, or our casting inbox bodyfixers@studiolambert.com or can call us on 020 3040 6933. Thanks so much for your time and help in our search, hopefully I’ll speak to you soon.